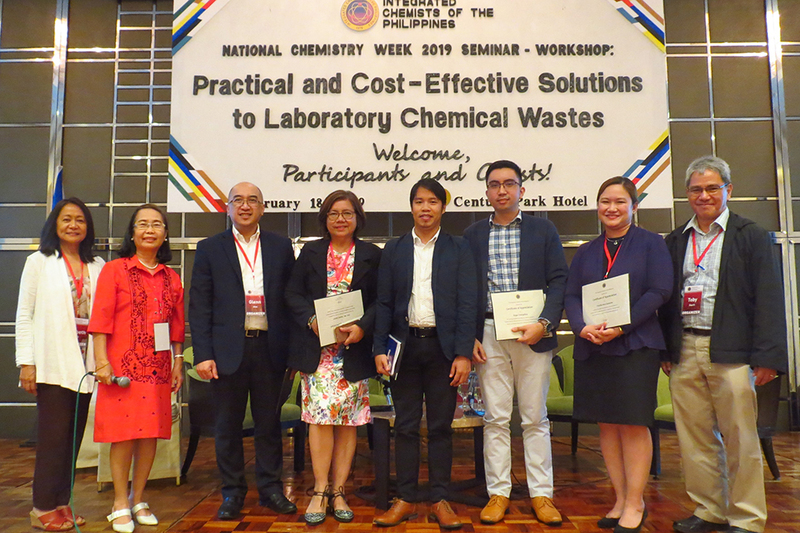 In celebration of this year’s National Chemistry Week, the Integrated Chemists of the Philippines (ICP) has organized a seminar-workshop on Practical and Cost-Effective Solutions to Laboratory Chemical Wastes held on 18 February 2019 at the Century Park Hotel in Manila. The event was well-attended by around 350 participants coming in from all parts of the country and representing diverse chemical sectors such as those working in the industry setting, educational institutions, government agencies, among others. Five well-versed speakers kept the participants abreast on the latest developments and updates regarding the said topic. Mr Roger Evangelista (Environmental Management Bureau) discussed extensively the newly-updated regulations on how to effectively manage the hazardous wastes of chemical laboratories. He also informed the participants regarding the important role of the Department of Environment and Natural Resources in monitoring generators, transporters, and treaters of hazardous waste for the benefit of stakeholders and the community at large. Mr Johanne Guilaran (Jefcor Laboratories) discussed extensively on the classification of hazardous wastes. He also mentioned ways on how laboratories can minimize the chemical wastes they generate. Ms Priscilla Alice Samonte (Nuevochem Specialties) gave practical information on how laboratory personnel would handle and store their chemical wastes. She stressed on the importance of segregation, using proper labels, and periodic inspection of stored wastes. The Honorable Ma. Teresa Cayton (Board of Chemistry, Professional Regulation Commission) tackled on the proper disposal and treatment of chemical wastes. She also reported on the latest figures regarding laboratories who are faithfully complying with the Chemistry Profession Act of 2015, and showed some examples on how laboratories practice either good or bad waste management. Lastly, Dr Glenn Alea (De La Salle University) emphasized on the safety practices that all laboratory personnel must follow while inside their respective chemical laboratory, such as the dynamic role of both employer and employees on laboratory safety, and how a company’s chemical safety manual must be regularly reviewed and updated. Certainly, the participants gained a plethora of knowledge and practical wisdom on how to further improve their laboratory waste management. The ICP would like to express its most sincere gratitude to them for attending this event and making it successful.